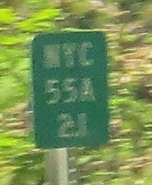 NY 55 follows the south side of Rondout Reservoir. NY 55A completes the loop on the north side. Views are available in several locations. The reservoir is part of New York City's water supply, so NYC owns the land here, and in an interesting twist, they actually maintain the road as well. In the city proper, city-maintained state highways tend not to have reference markers at all, but out here without clutter and, more importantly, without cross streets for maintenance and emergency reference, NYC came up with a similar-but-different solution. Just west of the eastern NY 55A split, NY 55 crosses Rondout Creek (the reservoir's outflow) on this repainted truss.